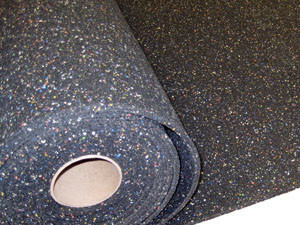 QQ Step Soft™ is a recycled rubber flooring underlayment for sound isolation, impact noise control and crack isolation. The rubber material provides a resilient layer within the flooring assembly for reducing vibration noise. QQ Step Soft is a critical component in meeting International Building Code requirements for ceiling/floor noise reduction performance. QQ Step Soft passes the Federal Flammability Standard, meets CHPS standards for VOCs, and passes the ASTM C627 reliability standard for residential use. QQ STEP SOFT™ is a recycled rubber mat that is meant for installation directly under a hard surface flooring product such as engineered wood, laminate, stone, tile or vinyl. The QQ STEP SOFT™ is glued or thin-set down in certain applications in which the finished flooring is completely bonded to the subfloor. For floating floors such as engineered wood, use floating QQ Step Soft™. Before beginning the installation below, all areas to receive QQ Step Soft should be weather-tight and have a constant temperature of 50 degrees for 48 hours before, during, and after installation. 1. Follow all subfloor requirements and preparation recommendations by the flooring manufacturer. 2. All subfloors and substrates must be inspected to meet requirements below before installation of QQ Step Soft. 3. QQ Step Soft can be installed over concrete, approved self-leveling materials, OSB and plywood. 4. If you will be adhering QQ Step Soft to gypsum concrete, use Specco S-55 to seal the gypsum before applying adhesive. 5. If QQ Step Soft will be installed with adhesive, use only recommended adhesives. For concrete installations (not gypsum concrete), test with calcium chloride test (ASTM F1869) to a maximum of 5.5 lbs. per sq. ft. in a 24-hour period. For gypsum subfloors, use manufacturer test methods to determine water content. 6. Floor should be completely dry and free of dust, paint, oil, wax, solvents, sealers, etc. according to ASTM F710. Any residues should be mechanically removed and not by use of solvents. 7. Subfloor should be smooth and free of defects and cracks. Non-moving joints should prevent transmission to flooring. Surface should be flat to 4-mm (3/16”) thick across any 300-mm (12”) section. Grind all high spots and fill indentations with approved self-leveling compound to meet flatness requirements. 8. For tile or other grouted installations on wood subfloors, make sure the subfloor is prepared according to ANSI L/360 standards as required by the flooring and grout manufacturer. 1. Deliver and keep all material in original packaging until ready to use. 2. All claims of damage must be reported to the freight company. Any defects in the material should be reported to Dependable immediately. 4. Allow material to relax after rolled out and before adhering to subfloor to allow normal stretching in the roll process to release. 1. Perimeter Isolation is installed before the QQ Step Soft. The Perimeter Isolation should be installed around the entire perimeter of the room where QQ Step Soft will be installed. 2. Perimeter Isolation is produced with a sticky side for adherence to the wall. Place the sticky side to the wall and cover all areas to receive QQ Step Soft. 3. Wrap Perimeter Isolation around all penetrations including plumbing, electrical, cabinetry and thresholds. 4. Place the Perimeter Isolation so that it is 1/16” above the subfloor to prevent wrinkling at wall/subfloor intersection. 5. Install QQ Step Soft flush with the Perimeter Isolation strip but not compressed or with a gap larger than 1/16”. 6. Trim excess when finished flooring is complete. 1. Allow the QQ STEP SOFT to acclimate to the room for one day prior to installation. 2. Remove the packaging from the rolls. 3. Using a chalk line, snap a line perpendicular to the longest wall in the room and establish a straight point of reference for the installation of the QQ STEP SOFT. 4. Cut the QQ STEP SOFT to the proper length and trim it for any penetrations or wall angles. 5. Place the QQ STEP SOFT along the snap line, cut the adjacent piece, trim it and place it adjacent to the first piece. 6. Fold the two pieces in half and apply the mastic to the area under the QQ Step Soft using a 0.125,” “V”-notched trowel. Apply adhesive perpendicular to the seams. 7. Place the material so that no bubbles or waves are seen in the area by unfolding the QQ STEP SOFT into the wet mastic or mortar. Ensure that no air is trapped below. 8. Repeat this installation for the second half of the QQ STEP SOFT by folding in the other half sheet; trowel the mastic under and place the second half into the wet adhesive mastic. 9. Repeat this process until the room is completely covered. Ensure that there is no greater than a 0.25” space between the wall and the QQ STEP SOFT. 10. Ensure that all mastic is installed to a uniform thickness, as puddles or differences in thickness can telegraph through the sound mat. 11. Wipe any excess mastic from the top side of seams while working. 12. Roll with 100-pound roller to remove any air bubbles or adhesive inconsistencies. 13. Allow install to cure for 24 hours. SEE DATA SHEET FOR COMPLETE INSTALLATION INSTRUCTIONS.